I love to learn, and part of my ongoing educational journey is reading and watching educational programmes. Last month I had the TV tuned to one of the public education channels to watch a BBC produced documentary titled “Hidden Treasures” with Griff Rhys Jones. I had missed Part 1 the previous week where Griff explored Australia. My interested peaked as I watched Part 2 where he explored West Africa to find traditional art in remote places. Part 3 was my personal favorite with dyeing and printing techniques that have been preserved in India through the ages. A quick search on the internet to find out if I could purchase this DVD had us locate it quickly. It was shipped from Australia and arrived in our post office box last week. 20 Feb	This entry was published on February 20, 2015 at 10:38 am. It’s filed under Art, Art Quilt Campus, Creativity Update, Design, History, In the News, Journaling, Product review, Sharing Resources, Workshop Opportunity and tagged Art Quilt Campus, Australia, educational journey, Griff Rhys Jones, HIdden Treasures with Griff Rhys Jones, Indigo, Shibory and stitch resist videos with Ana Lisa Hedstrom. Bookmark the permalink. Follow any comments here with the RSS feed for this post. 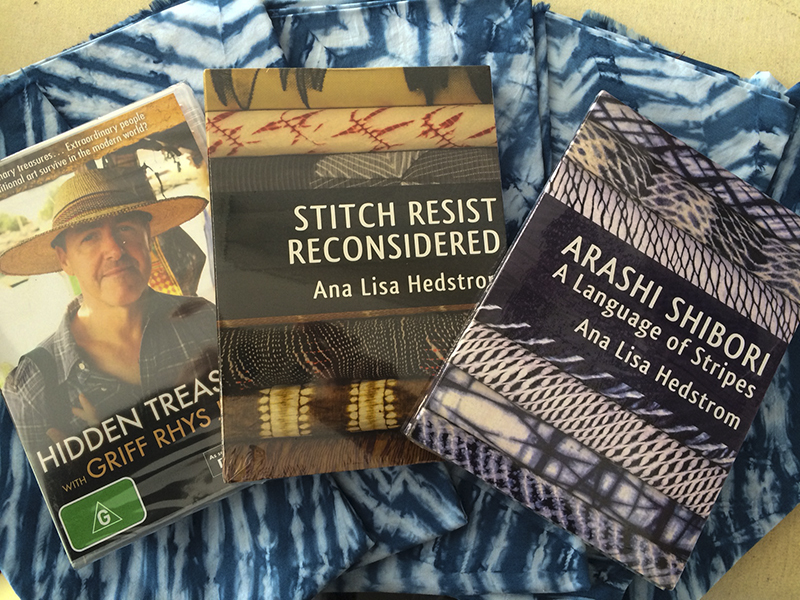 Is that “Stitch Resist Reconsidered” a book? I looked on Amazon for it and it does not come up . Hi Joyce, nice to hear from you… All three titles featured in the image are DVDs. Sorry, no books this time!